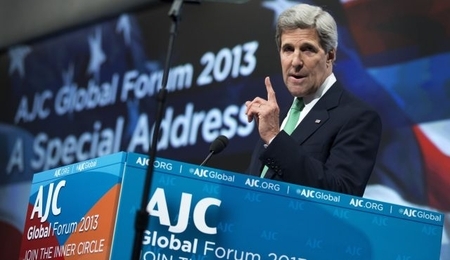 http://www.JewishWorldReview.com | Israel is "running out of time," Secretary of State John Kerry told the American Jewish Committee in Washington this month. A two-state solution to the Palestinian conflict must be reached soon or "the insidious campaign to de-legitimize Israel will only gain steam," he warned. "Israel will be left to choose between being a Jewish state or a democratic state, but it will not be able to fulfill the founders' visions of being both at once." It's an old refrain, erroneous but popular: Israel must make peace with the Palestinians - "peace" being defined as the creation of a 22nd Arab state - before high Arab birthrates turn the Jews into a minority in their own land. Arafat's boast notwithstanding, Palestinian women, like women throughout the Muslim world, are bearing far fewer children than they used to. Within Israel proper, the birth rate among Muslims has trended steadily downward and stands now at 3.5 children per woman. It is even lower for Palestinians in the West Bank - just 2.91, according to the CIA Factbook. In a 2012 survey by the Population Reference Bureau of family planning in the Arab world, 72 percent of married Palestinian women (ages 15 through 49) said they preferred to avoid a pregnancy. That was typical of the modern Middle East: The same survey showed most Jordanians (71 percent), Egyptians (69 percent), and Syrians (68 percent) felt the same way. It is easy to get tangled in debates over the statistics - Ettinger led a detailed demographic study that exposed serious flaws in previous projections - but the bottom line is that demography, far from being a looming liability for Israel, is a strategic asset. The 6.3 million Jews living in Israel and the West Bank represent 66 percent of the area's population (not including Gaza, which Israel entirely relinquished to the Palestinian Authority in 2005). "Anyone suggesting that Jews are doomed to become a minority west of the Jordan River is either dramatically mistaken or outrageously misleading," Ettinger argues. Is the "peace process" is worth pursuing? Would a two-state solution end the conflict? These demographic trends can't answer such questions. What they can do is remove the artificial pressure on Israel to do something - anything - before the sword of Damocles falls. And maybe, just maybe, they can open a few eyes among those who have been waiting, like Arafat, for "the womb of the Arab woman" to put an end to the Jewish state. 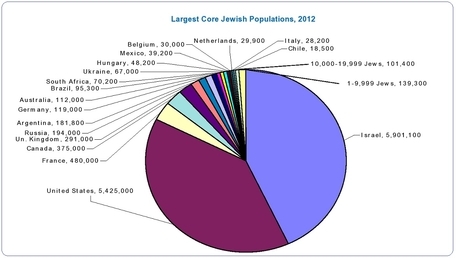 Israel, now home to nearly half of the world's Jews, is a permanent fact of life in the Middle East. Any genuine peace process must start by accepting that reality.